Whether your paint project is a large wall or a small craft project, you want the proper brush to apply your color. 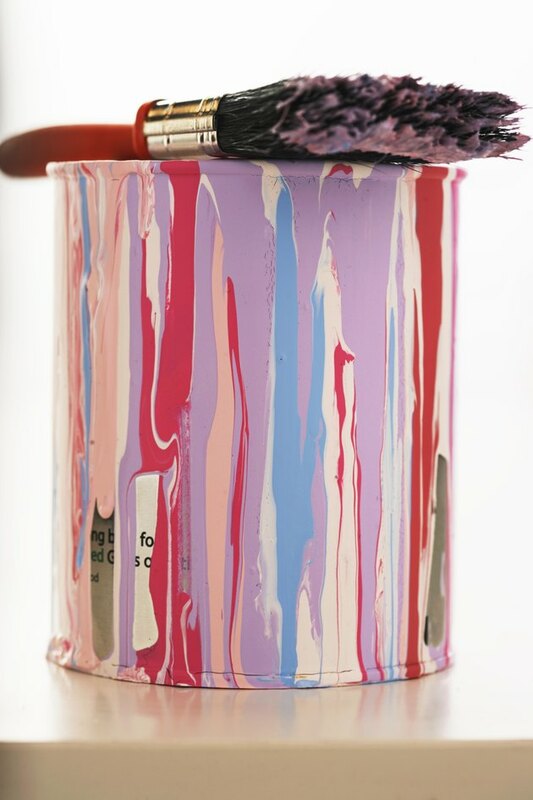 Brushes that fit into a paint can are available with either a foam or a bristle applicator. The finished look of your project will differ depending on the type of brush used, so keep the desired finish in mind when deciding which type of brush to choose. Bristle brushes are available in large and small sizes. Bristle brushes have many separate bristles that are bound together. The bristles are made of natural or synthetic fibers. Natural brushes, made of hog bristle, are not as common as synthetic brushes made of nylon or polyester fibers. Foam brushes are made of a foam, sponge-like material. The handles of both types of brushes are usually made of wood, but brushes with plastic handles are also available. A bristle brush is more expensive than a foam brush. Bristle brushes, especially high-quality ones, can be cleaned and used again and again. According to Paint Pro, nylon brushes are durable and clean easily but become less effective if used over an extended time period or in hot weather. Foam brushes can be washed and used again, but over time they break down and need to be replaced. If you do not enjoy cleaning brushes, the foam brush is a low-cost throw-away option. If you use a bristle brush, the final project will show the paint strokes. For this reason, using a bristle brush with latex paint over drywall is not recommended unless you have a reason for wanting brush strokes to show. When choosing your brush for wood staining, select the brush depending on whether or not you want the finished project to show brush strokes. A bristle brush will show the strokes and add a bit of texture to a wood project. A foam brush will not show the strokes, so the look and feel of the project will be smoother. Brushes also change the appearance of a final project according to how much paint they release. A quality bristle brush holds more paint and releases it evenly. The foam brush holds less paint, so you may have to use more coats to achieve coverage. The type of paint you choose will affect your choice of a brush. For best coverage with a latex or water-based paint, select a synthetic bristle brush made of nylon or polyester, or use a foam brush. When using oil-based paints or for staining purposes, select a natural bristle brush, a polyester bristle brush or a foam brush. What Paint Is Best for Furniture?